That's what you'll find here in this nasty little book - a mess of monsters, mutants, and misfits, from the nasty charnel hound seen on the cover of this book to the freakish glamourpuss on the back cover. You'll find legendary horrors like Bloody Romeo, mutated animals from the wastes like the desert gator, and even sentient military hardware like the Alexander 9000 hovetank! 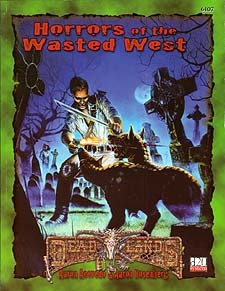 Horrors of theWasted West contains all of the monsters from the original Hell on Earth classic book Monster, Muties, and Misfits, over a dozen brand new creatures specifically created for the d20 version, and even a few of the most important creatures from our sister game, Deadlands d20.